The largest estuary in the United States, the Chesapeake Bay is a vital economic, cultural, and ecological resource for the region and the nation. Excess runoff and discharges of nutrients -- particularly nitrogen and phosphorus -- from farms, pavement, wastewater treatment plants (WWTPs), and other sources have placed the bay on the Environmental Protection Agency's (EPA's) List of Impaired Waters. 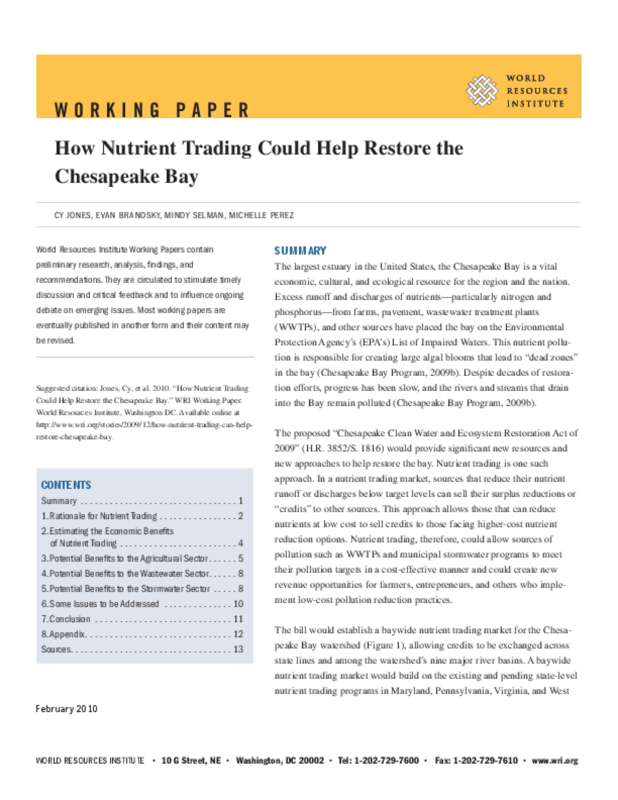 This nutrient pollution is responsible for creating large algal blooms that lead to "dead zones" in the bay (Chesapeake Bay Program, 2009b). Despite decades of restoration efforts, progress has been slow, and the rivers and streams that drain into the Bay remain polluted (Chesapeake Bay Program, 2009b).